At first, the evidence seems overwhelming: in the comic books, Thanos was a villain. He had the Infinity Gauntlet which seems to be what movie Thanos is after, and the title 'Infinity War' suggests Thanos will be moving his space empire conquering plans to Earth. So how could all this be wrong? Easy: because the fans are all racist. Just because Thanos is a giant purple space alien who happens to look like Thanos in the comics doesn't mean he is automatically evil. Surely as a society we have got beyond judging people by their appearances. The fans assume Thanos will be a villain because he 'looks like a villain'. For shame, Marvel fans. For shame. Even if Thanos is the same Thanos as in the comics, this proves nothing. There have been many changes from the comics to the movies, everything is up for grabs. What do we actually know about Thanos? In The Avengers, he sits in his chair in space, chatting to his Chitauri friends who are invading Earth, and watching events. It is important to note that it is Loki and the Chitauri, not Thanos who is invading Earth. Thanos doesn't get off his chair and attack, his friends do. It's not Thanos's fault that Loki and the Chitauri are so bad, and Thanos can hardly be held responsible for their actions (he doesn't have mind control powers!). 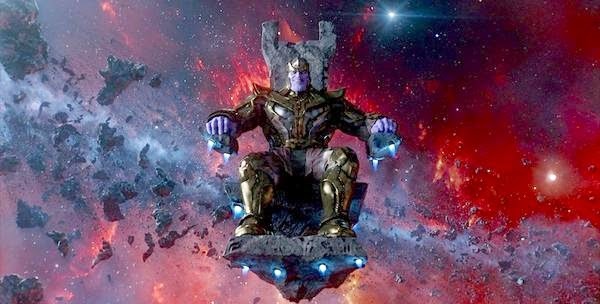 In sitting in a chair watching the events of the film, Thanos is put in the same position as the audience, and cinema audiences weren't found guilty of trying to invade Earth! In Guardians of the Galaxy, Thanos is seen again sitting in his chair watching some exciting events take place (much like the audience). We meet his friend Ronan and his daughters, though they seem to be much more violent than Thanos, who just calmly sits in his chair. All Thanos wants from Ronan is the gem, Ronan is the one who goes on a planet-destroying rampage. Thanos just wants to sit in his chair and watch fun Marvel movies. In Age of Ultron, we see that Thanos is forced to act, having got off his chair to fetch his glove. Again, fetching a glove is not an evil act - if it was, we would all be in trouble! All he says is "Fine, I will do it myself" which could mean anything - perhaps none of his friends are about, and Thanos needs to get a drink from the fridge - this scene does seem to take place in Thanos' kitchen after all. So what have we learnt about Thanos from observation and logic? Yes, he has a bad choice of friends, but their actions in no way reflect on him. He likes to sit in a chair and watch the Avengers - but so do we all! In many ways, Thanos is the audience surrogate character, placed in the films to show that even space aliens like Marvel films, not to tease any sort of big villain! Thanos will appear in Infinity War, that is for sure. But going by past appearances, it is more likely that he will simply pull up with his comfy chair, hold his ice cold coke in his special glove, and enjoy another two hour movie starring his favourite superhero team!